As I write this, Fox News is reporting that, with 73% of precincts reporting, Wisconsin Governor Scott Walker is ahead 56 – 43 in the recall election. Lt. Governor Rebecca Kleefisch also is winning with about the same percentages. I have to do some research about exactly what Gov. Walker has accomplished. More later. I think it was more telling that 69% of the people polled said that they believed a recall effort should only be for malfeasance, or not at all. That was probably more important than policy issues. So what does the SpaceX COTS-2 flight really mean? As those of you who have read my previous posts know, I’ve been a fan of SpaceX for a long time. I like the audacity of Elon Musk’s company, which has forged ahead and made extremely intelligent engineering decisions along the way. They have “stood on the shoulders of giants,” leveraging all that they could learn from both the US and Russian space vehicles that came before. 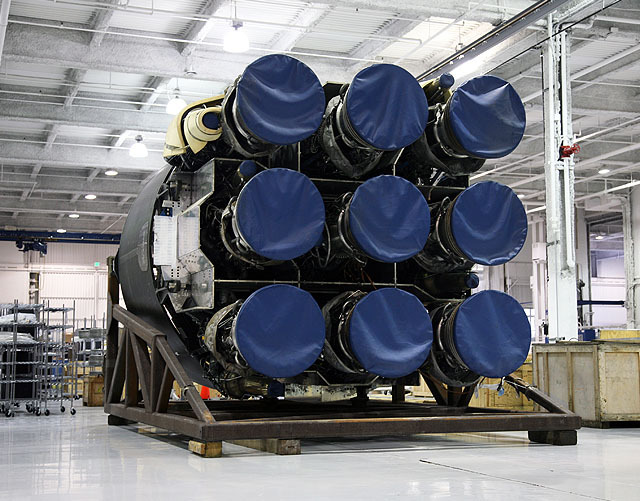 For example, the Falcon 9 uses more, smaller engines, rather than a couple of larger, higher-pressure engines. While there is a weight penalty, it also gives enough margin that the vehicle could continue the mission even with the loss of an engine. They also benefit of economy of scale, building more engines and therefore lowering the cost of each unit. The same engines will be used in the Falcon Heavy – 27 of them in the first stage – and a modified version is used in the second stage as well. Compare this to the Russian generic launcher, which has a pedigree going back to its ICBM roots in the 1950s. The technology of that time and place didn’t allow for the kinds of engines that could be built in the US. 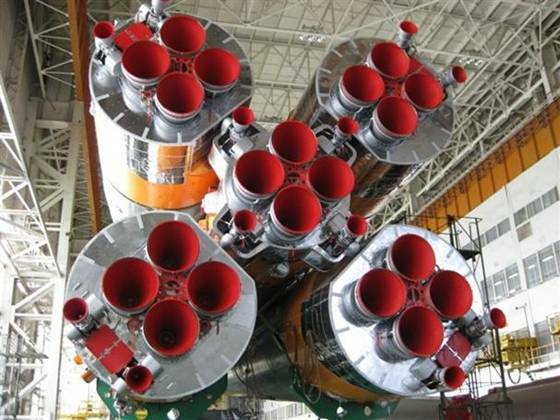 The standard Soyuz booster uses four in the sustainer and four in each of the strap-on liquid boosters. But it’s not the technical success or even the reasonable development cost that makes this flight so important. It’s lack of government interference. During the Mercury, Gemini and Apollo years, every piece of each vehicle was meticulously tracked from fabrication to launch. Some of this was quality control, and quality control is very important. Some was research – if components failed, often failures could be traced back to design or fabrication flaws. But, like every government bureau, the paper-pushers group grew as the group of engineers and researchers declined. The Shuttle was supposed to be refurbished and launched again within 30 days. In real life we were lucky to get two flights per year out of each vehicle. The Thermal Protection System was designed so that the entire surface of the shuttle was a jigsaw puzzle. All the pieces of TPS material were individually manufactured to fit a specific location and had to be hand-fit, some of them the size of your hand. This took a huge amount of time, and the material was very fragile. It only took a piece of insulation foam breaking off the External Tank to damage the TPS enough to cause a weakness that caused a catastrophic failure of the vehicle on re-entry. That whole situation was partly due to the 1970s technology of the vehicle. However, it was never improved. The vehicle received upgrades in electronics – thank God – but the TPS remained essentially unchanged. It took hundreds of hours of manpower to inspect and replace the tiles after each flight. To continue that example, Dragon uses a one-piece heat shield with large PICA-X tiles (using technology from NASA, actually) instead of an Apollo-style honeycomb shield that requires hundreds of hours of manpower to fabricate – which is exactly what Orion will have. Lower cost of fabrication, improved safety, new technology. Hmm. One of the reasons the DragonRider is taking so long is that NASA has to sign off on a lot of design elements. That’s why SpaceX hired former Shuttle astronauts – not just to lend their experience to the design process, but to improve credibility with NASA. Nothing from NASA ever comes without strings! So the successes SpaceX has enjoyed so far are due to smart design, good quality fabrication, good management, and less interference from government. Hmm. Really? Maybe getting bureaucrats out of the way actually does may business more successful. Who knew? You are currently browsing the The Old Gray Cat blog archives for June, 2012.